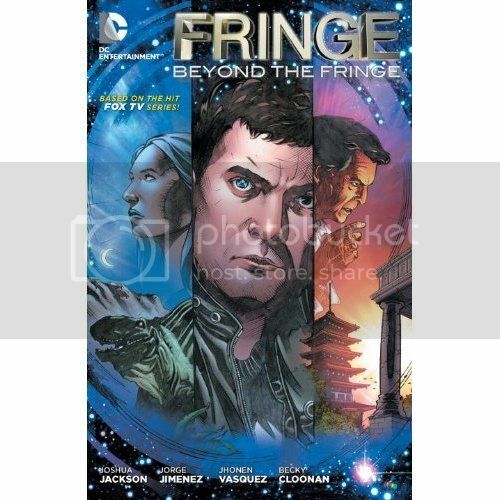 Hot on the heels of FRINGE Season 4 being released on DVD and Blu-Ray Tuesday, the previously online-only series Beyond The Fringe has been collected into a trade paperback that appeared yesterday in comic stores. The collection makes the entire recent series, including Joshua Jackson's acclaimed Peter And The Machine, finally available in print, although Jackson's story did appear earlier this year as a one-shot issue. Speaking of that tale, specially marked copies of the Season 4 set are available at Best Buy that come with a mini-comic of the Jackson story. A yellow sticker on the front of the DVD or Blu-Ray will alert you to it being included inside.